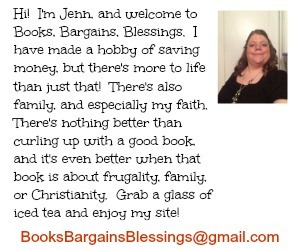 Books, Bargains, Blessings: Where do you live? After a recent post about swapping books, someone asked why I don't get them from the library. After thinking about this a bit, it seems like so much of how we save money is based on where we live. How many of you went into your bank last summer and left with FREE fresh vegetables? I would highly suspect I'm the only one who did. Same with driving down the road and seeing "Free" signs beside of a pile of vegetables. Or a cart of green peppers with a little container by it and a sign "15 cents each". In a city that's unheard of! I am very lucky that a Walgreens went in near me about a year ago. Before that it was about an hour to the closest Walgreens. It was somewhere I never shopped because of the distance. It is an hour to the closest in-state library that does inter-library loans. About 95% of the books I read are non-fiction and often things most people aren't interested in, so that would mean needing inter-library loans for the majority of what I read. (There is one public library near me that doesn't even have a telephone or computer and is only open about 9 hours a week. To someone who lives in a larger place this is likely unfathomable.) The IRS allows anywhere from 14 cents to 50 cents per mile deduction when you drive somewhere. (Not that it would be tax deductable, but let's say it does cost 50 cents per mile wear and tear on the car plus gas.) A round trip to this library would be $35. At 14 cents it would be almost $10. Many of the books I read are paperback and I could order them from Amazon for the $10 range, so why not just buy it and be able to keep the book. And that's not counting the trip to return the book! This is just not an economical option for me. Last year I read 94 books. I earn a lot of free Barnes and Noble gift certificates. I would watch for coupons for anywhere from 15 - 40% off. (I just received a 40% off coupon in my e-mail today. Need to decide what to buy.) I would then combine the coupon and gift certificate. Then often times, once I'm finished I will sell the book. Last year, I read 94 books. Because of also buying books at thrift shops, yardsales, book sales, etc. I actually MADE money instead of spending any reading my books. (Yes, this even takes in account postage spent from swapping books. And keep in mind, there's a rule on the book swapping site you cannot sell books you got from there, you are to swap them if you don't want to keep them.) Plus I always have the option of keeping a book if it's going to be something I want to refer to in the future. Where you live can make a large difference in how you save money. There used to be a man near here who used to sell FIFTY POUNDS of potatoes for $6. I'm not sure if he still does it or not, but I doubt anyone in a city could find that many potatoes for that price. Learning to save money needs to be adjusted for where you live. For instance, I lived a summer in Asia. What's one of the cheapest meals to make in the USA? Spaghetti. Over there it was a lot more expensive because sauce was imported from Australia (and I didn't like Australian sauce, and Ragu was like $6 a jar 12 years ago.) So, it was much cheaper to eat what the locals did. Ramen noodles were just as cheap if not cheaper there! McDonalds for some reason was about half the price it was in the USA. Although I did eat spaghetti a couple times, I considered it a "treat" and wasn't something that I would fix often because of the price!